Wrongful convictions: Research by D. Michael Risinger, Professor of Law at Seton Hall indicates that 3.3%-5% of those convicted of crimes are factually innocent. Some have estimated 130,000 to 260,000 American inmates did not commit the crime they've been convicted of. My son is one of them, convicted of murder despite exculpatory evidence. This blog is dedicated to exonerating him and others by raising our national awareness of wrongful convictions. The following download from Google Earth of 615 Conrad in Colorado Springs has been overlaid with red dots indicating positions of blood spatters reported by crime scene analysts. 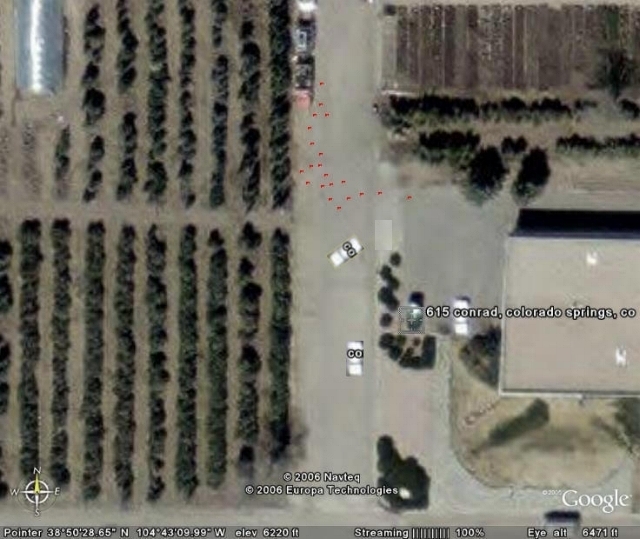 The dots hyperlink to detailed photos made by the police of each spatter. The two white vehicles in the roadway have also been added. The upper vehicle is the one that contained Chas Schwartz, Anthony Madril, and Chisum Lopez. The lower vehicle is the one that contained Joel and Todd Newmiller, Brad Orgill, Mike Lee, and Jason Melick. Click on these trucks to see police photos of the actual vehicles. The brightened rectangle in front of the upper vehicle links to a crime scene close-up showing a tire mark that may show the track taken by Chas's truck as it began to leave the scene. None of the witnesses ever placed Todd by Anthony. Chisum exited the truck before Anthony and reported being immediately confronted by Todd in what he described as a trash-talking stare-down. This confrontation in its entirety took place just outside the passenger door of Chas's truck. While Chisum concentrated completely on Todd, Anthony got out of the truck and met up with Brad. Chas reported that he saw Anthony and a person he described as the fat guy (Brad weighs in well over 240 pounds) fighting fiercely about 20 feet in front of the truck, moving from the east side of the street to the west side. As they fought their way across the street, Chas heard Anthony say, "It's on, it's on. Let's go." Anthony and Brad fell to the ground on the west side of the street. When Anthony got back up, he was covered with blood and said "I just got stabbed." Transcripts from the police interviews with Chas and Chisum are available online. To read them, you need the Adobe Reader. The vehicles went directly to 615 Conrad from 5975 Terminal Ave. Learn about the crime scene analysis done by the Colorado Springs Metro Forensics Lab.